Personal trader express and personal merchant express (for self-use) into something non-interactive in the world like personal bank access express. It is currently impossible to use both the personal trader express and personal merchant express together due to the 5 minutes despawn timer of the npc. Restore personnality system. It made our characters more living, spent a considerable time making special personnality trait for my toons. It's not annoying, could even have a smaller pannel for it showing only personnality trait, bar of ferocity/dignity/charm if hovering on it. I wish we could individually combine inventory bags so that i could have my inventory look like this. The Pact Scout's Mapping Materials should have a Consume All option. I erroneously put this in a separate thread. Pasting it here instead. Mods feel free to delete the other post. Hopefully it is not already buried in the previous 14 pages of posts. Are the devs/decision makers willing to consider a change to the daily resetting of "rich nodes" from "24 hours after your account last gathered the node" to "The Daily Reset"? We have a daily reset that affects practically everything else that people do on a daily basis (daily quests, world bosses, guild hall gathering, etc. etc). And being forced to come back to node x 24:00:01 later than the last time I was here seems rather contrived. I do not record, either precisely or imprecisely, the times that I am at any of these nodes, and I do not think it practical or reasonable to do so. Hopefully others agree. The goal is to limit the gathering from rich nodes to once per day, and I should be able to do this at any point within the day, as limited by The Daily Reset. Am I wrong about this? BANK - I would like the Player Bank to have namable tabs like the Guild Bank. Also to be able to move the entire bank tab instead of one item at a time. I'd also like the option to minimize or expand all tabs and a toggle to do this auto when opening the bank. BOOKS - Add books, pages, etc to the novelties section under a library sub section. The lore is very extensive in GW2. But I find it a waste that a player member of Durmand Priory doesn't have access to their books they have found along the way. DOGS - Dogs for the home instance. nuff said. You could make a Merchant that refunds unwanted Bank Access Express items for Black Lion Ticket scraps or another BL item, similar to how you can refund your Mists Potions for Fractal Relics if you have the Infinite version. I know LWS3 are old maps but could we get icons for the unique nodes for bloodstone fen and ember bay like what you guys did for episode 3 onwards. just simple updates like even the collection box from the first 2 episodes do not have a border whereas from episode 3 onward features the exotic border. an update to the textures of celestial infusion to match the gorgeous star mount skins and the cosmic mining tool etc. I have an idea posted for disappearing and re-appearing UI. The idea is that if you are out of combat, the UI disappears automatically. With an optional "compass" remaining for navigation as an option. In domain of kourna, can we have an icon for volatile magic crystals around the map? I have developed psychic power to control people. Devs, I'm now controlling you to significantly reduce (or add the option to turn off) the bright camera flashes from Holosmith's sword skills, utility skills, and Photon Forge skills so that I can play Holosmith without eye pain. I'm also controlling you to significantly reduce (or add the option to turn off) the bright flashes when attacking with flaming swords such as the Cobalt and Fiery Dragon Sword (noticeable with dark background) so that I can use these skins without eye pain. You are getting sleepy~ Wait, wait. Not the sleepy part. Plz, pretty plz, downgrade Inquest data security officer in Sandswept Isles in "Stop the flow of Inquest data to thwart their operation event" from Champion to Veteran, I have enough of all those trolls killing all the 2 first waves and abandoning the champion after doing that, make him veteran, that way we can have the special buff "Lab Alpha-(11/12/13) blackout" to unlock inquest chest all around the central area. About that, downgrade all veterans around inquest chest to normal foes. Also those seems to have a bug since they don't reward any items. Give players an option to disable interaction with other players' Mesmer portals and novelty items when not in the same squad. Another option is to prevent players from placing these on loot chests. Currently, there are too many pathetic trolls that try to annoy players by setting these on loot chests in HoT metas. It would be awesome if you could select to disable player created interact able items. Can you open the door to the Great Lodge of Hoelbrak just a smidge more, so that mounts can fit in? I still want a tricycle with tassels toy I can ride in wvw while flying kites, similar to the other travel toys. If this is happening, please have it as an option. I want my ui up all the time. The ability to lower Renown Heart priority in the content guide or to display them in parallel to other exploration features.Nothing is more annoying than hitting 98% map complete and having to backtrack across the map because you missed a PoI you passed near enough for a deadeye to shoot because the renown heart tracker prioritised holding back the insurrectionists 3-4 zones over. Also, also - maybe an option not to have repeatable things stop reappearing at all once youve done them the first time? Like some sort of 'im working on map complete today' mode. Recently my gpu died, and I'm playing on internal gpu while I wait for RMA, currently with no sound because no HDMI. I mostly PvP/wvw though and with the current state of one shot bursts from stealth having sound q's are half the fight, caltrops and mesmer animations are telling, you know what style of tactics your going to need, roughly prepare to dodge. My suggestion is in sound options you have a check box to disable sounds so only deaf can benefit from it, and it add class colored arrow to the edge of your screen when specific audible skills are cast within a hearable range for friend/enemy alike as is roughly the benefit to having sound. Can we choose what we want to transform to instead of using that change transform button that give me in 70% of the cases the same transformation? Also would be nice since we are focusing on kralk currently to add more branded to that tonic like branded centaurs, riftstalker, awakened? I have a lot of fun with it, running around in DR as a branded griffon/ wyvern. Endless animal tonic shouldn't have rarity, just acting like the branded one. Please add Laurels to the Tyrian Exchange Voucher. They cannot be farmed, and some people are running short of them. You have decided to make recipes and items gated behind this currency since PoF, so please add additional means to acquire them besides the daily login. OR, alternatively, add a second means of payment to those items and recipes. Thank you. Give us more selectable stats for Ornate Guild Armors, please. I want to experiment with Viper gears. However, since Viper exotic gears are expensive to craft, it would be too costly to make a set per character just to experiment. If Viper stats were added to Ornate Guild Armors, I can at least send the armors between characters of the same armor weight and experiment without spending a fortune. TLDR: Mentor icon/purpose tutorial for new players. The Mentor ship is a wonderful tool for helping new players to find their feet, but all too often I see new players run up to me while I am typing or waiting for a question and they interact with me like I am an NPC and when "F" doesn't do anything they continue running on past. When I get some new player who asks why I am on their map and I explain what a Mentor is, they are shocked that the system exists. The Mentor ship system is working fine, but new players just don't know what it is or how to use it. Whispering for advice for instance or even how to whisper. I would hope that some sort of language localized information would be available to the new players describing the original intent of a Mentor. If it is in place; its not working. Please enhance the coverage for this incredibly useful tool for new players. A trader for black lion chest items that you don't need, such as hair kits or bank access. I have the permanent hair kit and getting those out of black lion chests is very disappointing since I have absolutely no use for them. Being able to trade these straight across, even if it's just for a bank access or TP or Merch would be awesome. Another option could be being able to trade say 3-5 of them for a black lion ticket scrap or something. Would love to see capes added to the game as they were in GW1. Dogs and other pets (bunnies accepted) for home instance or for Sun's Refuge. Would love to see more things put into Sun's Refuge or even some nodes that are only for that area. Give us a reason to keep going back. Just seen an adorable raccoon running around, could let us get pets from across Tyria to live in our home instances. Please put the Mystic Chromatic Ooze tonic into the wardrobe! Let it be usable in combat! Fractal Armor <This would be fun. Wouldn't even have to be legendary. Also, I have a lot of suggestions for themes of upcoming fractals, but not sure if there is a page for that? 2. Even better would be that all classes had the option to have their own version of permanent minions/pets/summons/clones. 3. Skins for necromancer minions, so we have the option to have something prettier following us around. 4. Account-wide gathering tool slots. 5. Account-wide crafting, so all characters can do all the crafts learnt. 6. More Jeremy Soule music. I'd like to see the implementation of windowed fullscreen in non-native resolutions (for example playing the game in 1080p on a 4k monitor). I dunno if it's cool or useless but: An option to reset map completion. Erasing all map completion to allow you with the same character to re-complete everything and re-earn maps completion reward for doing so, would avoid to players to re-create toons just to complete maps. In this case, all items (excluding Rares and Exotics ) that have Runes\Sigils will be salvaged, saving non-upgraded items. as someone who's played this game since launch with an xbox controller. I would love this feature added. Even a complex game with many buttons can be made more accessible for others players, adding this would help greatly. Oh also if possible can the ground targeting on skills be made to not cancel when u click a none targetable surface. So I can keep clicking without having to go down the screen, reselect the skill then try again to click the surface that want again. A lot of surfaces have tiny rocks and obstructing all over the place breaking up the nav mesh. Light of Deldrimor plates Bottom and Top half should be GUARANTEED drops. It's UNACCEPTABLE to lock 2 Points of interest of the map behind an item that is not even guaranteed to obtain from the meta! IMAGINE players which do both metas and don't loot plates what do they receive? NOTHING. ah excuse me just a bunch of unidentified gears and dragon crystals* 10 golds the key on TP where are we going?!! Make it account bound, let's not disturb the economy anymore. Simple solution: Add ghosts/shades/skelks in catacombs which drops plates if the drop rate isn't planned to be changed. PS: increase POI detection range in domain of kourna for Research Vault Beta, that way no need to wait for mutated rats event, another annoyance. QoL Suggestion: Collapse All/ Expand All. I posted this a bit ago and am requesting it again as I feel that strongly about it. When you interact with a crafting station your list of recipes opens up. Let's just call that the recipe book ( I don't know its formal name). I recognize that you can query your list, via the cog at the top, according to various parameters. However, this isn't always intuitive or quickly done. What would be nice to have is a simple "Collapse All" / "Expand All" option. As it is now, each time you move away from the workstation and return, you have to scroll thru the list again. If I am refining a variety of material, for example, I would need to either scroll down or type in the name. Every day when I craft my daily cooldown mats, I have to scroll thru the long list of recipes. If I have a "Collapse All" option, then with a click of a button I could quickly select the Refinement section or the Ectoplasm Refinement section. The cherry on the top of my suggestion would be that the program remembered the last selection made (either collapse or expand). This would make facing the crafting stations a bit less cumbersome. Any word on when (wink wink) will Mystic Chromatic Ooze be added to Novelties? Important qol update. Renaming bank bags for better organization. Like for exemplo rename my first bank bag "Itens for Twilight" and the second "Consumables" and other "Itens for Mawdrey". Also the account wide gathering tools slot. Can the Spears also pick up automatically when near, like the mines? It's way less immersion braking when you don't have to dismount, pick up the spears, then remount. Not to mention it can leave you not able to remount because of how combat and mounting work. 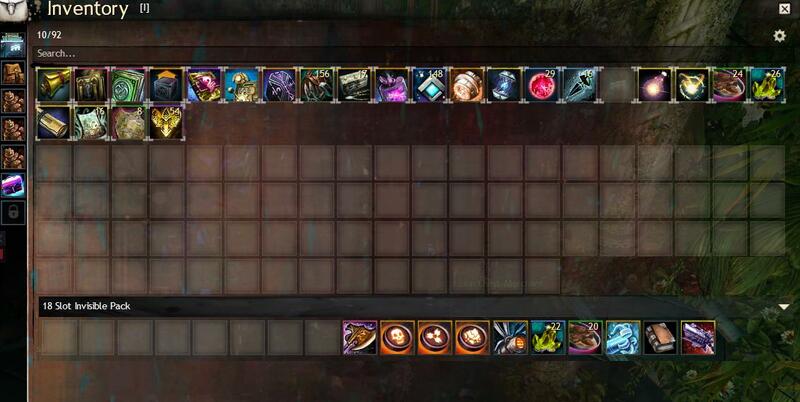 Make unlimited black lion tools work from shared inventory slots or add a vendor where you can get copies for alts. They cost plenty for a quality of life upgrade, and if you have a lot of alts it's kinda rendered useless atm cause you constantly have to equip/unequip them and trade them over to the next character. Just projecting it on me for example: I got 50+ chars and even though I have the unbreakable set, I never use it cause it's easier to just fill 2 inventory slots with a spare orichalcum axe/pickaxe set and buy new ones when passing a vendor sometimes than to constantly swap the unbreakable set over and over again. Suggestion: NEW indicator on items in the wardrobe that you haven't seen before. I'd love to see Stalwart Speed on Firebrand's show up on the buff bar. I ask for this because it's hard to time exactly when seven seconds pass before you take effect of Stalwart Speed, so you'might not be sure if quickness was granted to your squad members correctly. This would be a very helpful quality of life for people who love quickness firebrand and can easily track when the trait is back up. I'd love to see a special window in either hero panel wardrobe or as separate little tab to help us see all the armor pieces/skins that we are missing. When we go to Hero's Wardrobe and click to transmute a piece of gear, it would be cool to see the pieces that we haven't unlocked yet...as that way we could preview some specific pieces and mix and match them without having to go all the way to the bank to preview these options. It's great fun to look at all the skins and stuff while waiting for an event or just afking in a zone without having to TP to the bank. Another thing that would be cool would be to show where we could obtain specific skins without having to Google where to find that. For example: crafted (x profession), world drop, vendor at X, dungeon, raid, gem store, etc. I just started recently but after getting to max and doing some of the big world events and bosses I would love an option to turn down or off other people's particle effects. Its a crazy light show which looks cool but I cant tell what is happening most of the time due to it. Another thing would be to hide weapons when sheathed. Its not really a big deal but it would let some armor sets look more impressive without a big honking greatsword blocking out the view. A 'keys' from my /home/instance that I can give to friends, so they can visit my /home/ even if I'm not online. I'm dreaming of an NPC, at the entrance of dungeons that can boost you at the maximum. But remove your eligibility for rewards. Has it been asked that Baubles and Bauble Bubbles are put in the Material storage? I'm sure it would have been. Also I would like to suggest a Map Currency Converter. Basically you can convert old map currencies to newer ones. There would be 2 rules (at least) tho stopping people from just making what ever the newest currency is. 1st anything that is unbound magic based cannot be converted to volatile magic based and the same in reverse. 2nd the converter can only convert currency up to one map behind the current map. (Maybe 2 maps behind). This way no one can just convert built up mats and change them from the newest material people would still have to work for them. BUT people who came late to the older maps could still have a chance to complete things in the older maps. Sell it in the Gem Store It would be a MASSIVE seller.